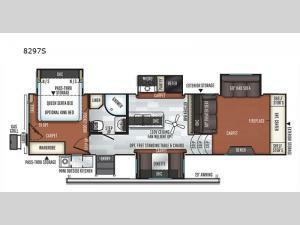 See just how easy and fun camping can be with this fifth wheel with four slide outs. Straight in from the door is the bathroom where you can easily get ready for your day. The rear bedroom is a spot where you can find comfort and rest. Here, you'll find a Serta queen bed, a large wardrobe, and you can add an optional TV. The kitchen area features dual opposing slide outs and plenty of room to move about while you fix your meals, plus a counter peninsula. In the evening plan to retreat to the front living area where you can watch your favorite movie or show at the large entertainment center, plus there is a fireplace which is nice for those chilly evenings. Within the roadside slide out there is a 60" hide-a-bed sofa where your kids or guests can sleep at night. 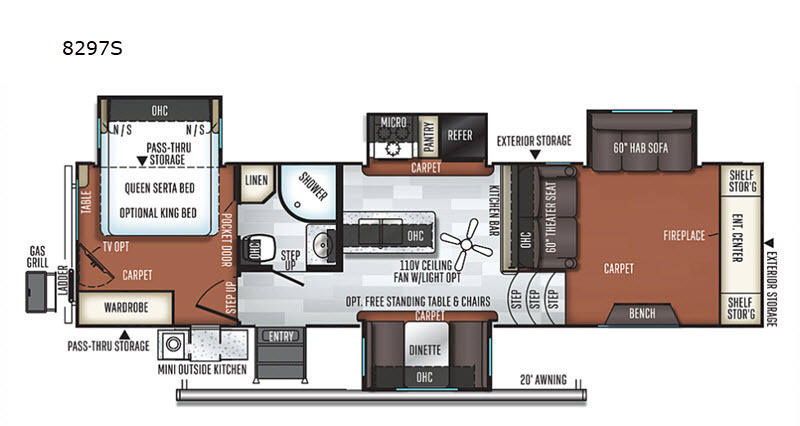 This fifth wheel also includes a mini outside kitchen the chef of the family will love!